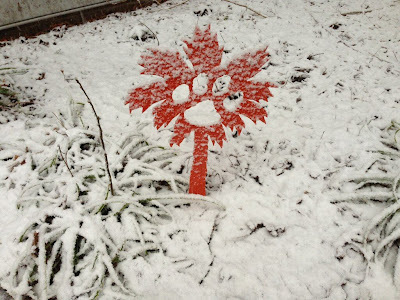 Clemson Girl: Orange and "White"
This weekend brought unexpected snow for many of you in the South, and probably more snow for those of you up North. Clemson Girl Twitter follower, @mcmlanc tweeted us this lovely orange and "white" photo. We love it! We love sharing your snow photos - did you capture your yard, house, kids, pets in the snow this weekend? Submit your weekend snow photos and we'll add them to this post to share! Email your photos to us at clemsongirlblog@gmail.com - make sure you include details about the photo and your name and where you are from.